Hello again everyone! If you keep up with me on Facebook, you already know I’ve been in a bit of a funk this week- and if not, you may have thought I dropped off the Earth. I think I’m back to feeling normal, though! A few announcements! I think a very small part of my funk was being restricted to these theme days (though most of it was not polish related). I thought they would be a great idea to keep me motivated, but in reality it’s having the opposite effect. In light of that, I’m dropping Flakie Friday. This will be the last official Flakie Friday post. I’m keeping the other 3 (Mani Mondays, Try It On Tuesday, Indie Wednesday), but I won’t force myself to do them each and every week. If the mood strikes me to wear something else? I’ll do it! So onto today’s post. I’m sure you guys have seen me raving about the new releases from Syn Cosmetics- and some of that is what I’m going to feature today! Syn Cosmetics is an indie makeup brand that recently (a few months ago I believe) added polish to her lineup. Be sure to check out everything she offers! First up is my very first purchase from Syn- All White Everything. Its a very roughly similar idea to Lynderella’s Love, Lace and Lilacs, but in no means a dupe. I don’t own LLL, but this one lacks the heavy fine white glitter and the variety of hex sizes. But if you’ve been looking for a nice, white CTD type glitter, give this one a look! Next up are 2 that I was SO excited to play with- her newest additions to the line, solar changing polish!! She has an awesome video available on the site! Obviously, the photo on the left is inside, and the one on the right is outside in the sunlight. I alternated between Solar Skies and Sunkissed- Sunkissed is the pink and Solar Skies is blue. Both appear the same- a milky clear- inside. I layered each over 2 coats of white polish, followed by 2 coats of the solar changing polish. I will say, I was a little disappointed Sunkissed didn’t quite show off as well as Solar Skies. Look at the bottle! The color change is HUGE, but over white it just wasn’t as noticeable. The blue was very apparent though! These also definitely require sun- being inside, no matter how well lit or even ambient sunlight you have, they’re going to remain clear. As soon as you step into sunlight outdoors though, it changes fast! So what did I do? Went back inside, and added more coats of Sunkissed. This is 4 coats of Sunkissed, and you can see it a lot better! Even with 4 coats, it wasn’t overly thick- so it’s definitely doable! LOVE these! Even my husband was into it, and thought this was the coolest thing ever. They’ll be releasing color-to-color changing ones soon, so keep yours eyes out! Last one up is my quasi flakie of the day- a new unnamed Syn polish! 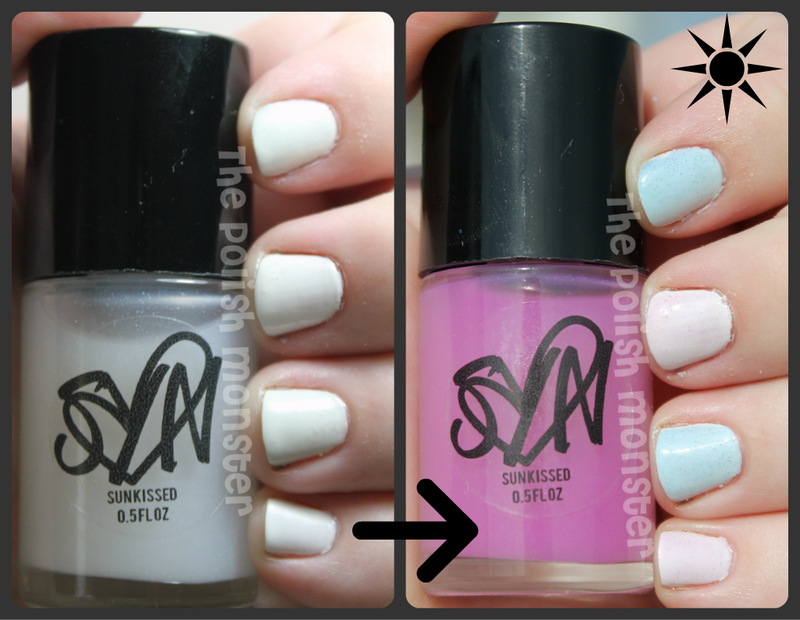 There was recently a promotion that if you spent $30.00, you would get one of the upcoming, unnamed polishes for free! I nicely asked if I could get this one- I LOVE pink of course, and I love shards and flakes and fun things! I am in love with this! Ya’ll, this is only ONE coat! This has a little bit of everything in it- ultrafine pink, fine white, hot pink squares, pink hexes, white and black shards and bars. I layered this over 2 coats of Zoya Adina (another Try It On Tuesday color- I’m working ahead!). You can purchase Syn Cosmetics on their site here, and follow them on Facebook for updates here. Be sure to check them out!! You’ll always find awesome promotions on Facebook- I’ve caught the buy 3-get 1 sale as well as a 35% off flash sale! This entry was posted on August 3, 2012 by The Polish Monster. It was filed under Uncategorized and was tagged with Flakie Friday, glitter, Hard Candy, indie, Indie Wednesday, solar, Syn Cosmetics, Zoya.